We use own and third-party cookies to improve your experience on our website through the analysis of your surfing habits. 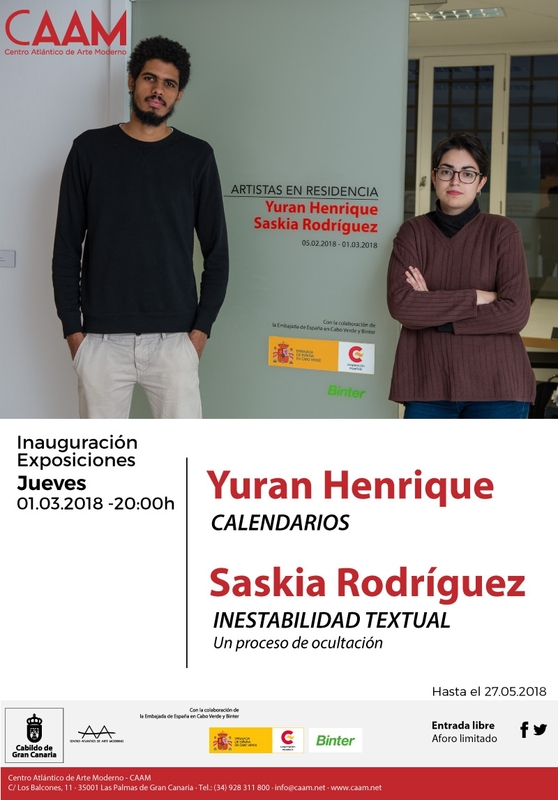 The Centro Atlántico de Arte Moderno (CAAM) presents the expositions of the Cape Verdean artist Yuran Henrique and the Canarian artist Saskia Rodríguez, who have done their artistic residence in this Art Centre, of the Cabildo de Gran Canaria, during February 2018. Both expositions can be seen from 1st March until 27th May 2018 at the exhibition rooms on the second floor of the CAAM. They are both the outcome of the second edition of the “Artists-in-residence” program, carried out for the second year in a row, with the aim of promoting the creation of unpublished artistic projects at the CAAM. Yuran Henrique presents a selection of 10 paintings named 'Calendario', while Saskia Rodríguez presents an installation called 'Inestabilidad textual. Un proceso de ocultación'. Both artists have also done a common work, 'Un cuadro muy guapo y un plátano'(2018) as a result of the good vibes they have had during this residency period. Saskia Rodríguez was chosen as an artists-in-residence through a public contest held by the CAAM for artists from the Canary Islands, while the Cape Verdean artist Yuran Henrique did his residence in collaboration with the Embassy of Spain in Cape Verde and Binter. The project of Saskia Rodríguez (Gran Canaria, 1993) is focused on the edition and fake ideas. The concept of ‘fake’ is used in art to raise questions about how to build creativity or how values of truth are generated in society. In her work, a pile of false newspapers “appeals to the necessity to spread information even if they do not keep it to, or a string of drawings that pretend to be letters or unreadable manuscripts”. The main objective is “to generate a continuous doubt of what the artists considers what is the central focus of our visual culture; the reproducibility of an image and consequently the confusion of excessive information. After the search for (re)present the characters as an illegible tool, that has nothing to do with the language, she proposes to understand the message absence through the censoring or disappearance of texts. To that end, she uses the unwritten writing, creating a graphic code that refers to but does not literally represent what is supposedly written or intended to be written. The basis of the project are the ideas of edition and fake, a string of pieces built on lies in which the audience does not know the whole truth about the object/image that is watching. John Berger states that advertising is the culture of a consumer society, and it spreads through images what society believes ofherself. The significance of the folded and almost concealment of the image is a key, because it only gives us the option to access to certain part of the supposed message. A false attempt of communication with each other, texts that are images and images that look like texts”, explain the artist. The work of Yuran Henrique (Island of Saint Vincent, 1993) is pictorial and it is primarily based on illustration and urban art. From a very young age, he shows interest in painting, illustrations, urban arts and theatre art, taking part in several theatre performances. He lives and works in Praia, capital of the Cape Verde archipelago. His works describe his life-scenes and experiences of the reality in cities and districts of Cape Verde, trying to break those negative stereotypes of the African and Cape Verdean’s identity, as well as he questions the identity and aesthetics of this universe. Regarding the project carried out at CAAM, the artist explains that “inside a metaphoric fantasy, which is disturbing sometimes, compositions find their harmony in the very own chaos”. In this way, he pretends to show “the states of soul change in search of the deep inside. The concept of time takes us to a world that is changing and encourages us to keep living, adopting as to the changing world. The unconscious desires of our nature, primitive intuitions, and quotidian experiences. These transitory states of the thinking are represented in these paintings”, says Henrique. Las Palmas de Gran Canaria. Spain.